Interested in hosting WordPress on Google Cloud? 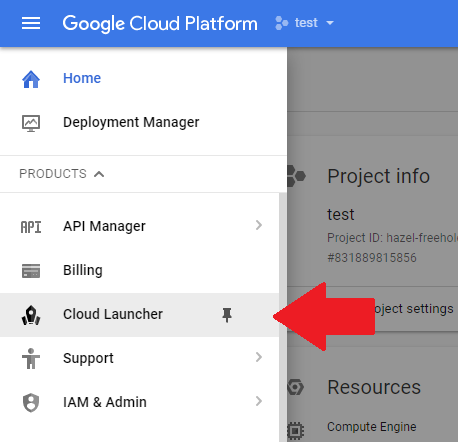 In this tutorial you will learn how to install WordPress on Google Cloud using the Click-to-deploy version of WordPress on Google Cloud. Running WordPress on Google’s massive cloud network allows you to take your WordPress website to the next level. Although hosting WordPress on Google Cloud offers amazing performance, it can be challenging. If you’re a new to the development world, you may be interested in managed hosting; there are even managed cloud hosting providers (view tutorial). To get started, create a free Google Cloud account and follow along with the video above. If you get stuck, check below to see the steps listed individually with their commands. Go to your Google Cloud Platform dashboard and click the hamburger menu in the upper left-hand corner of the screen. Click on the Cloud Launcher link in the left-hand menu of the screen. Update 08/22/18 – “Cloud Launcher” is now “Marketplace”. Select the WordPress Click-to-Deploy version. 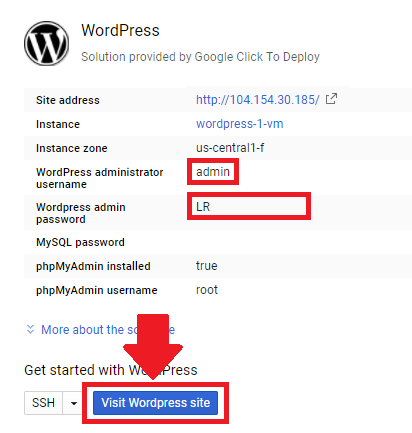 Click the “Launch on Compute Engine” link to open the WordPress deployment settings page. Fill out the fields in order to choose your WordPress installation settings, making sure to check the boxes to allow HTTP and HTTPS traffic! Once your WordPress instance has been successfully deployed, copy the command in the black box, then click on the SSH button above. Paste the command in the SSH terminal, press enter, and follow the onscreen instructions to change your mySQL root password. Take note of your username and click on the phpMyAdmin link to access your website’s phpMyAdmin page. Use the existing username and your newly changed password as credentials to log in. Test out your WordPress website by taking note of your WordPress username and password, then clicking on the visit WordPress site. To login to WordPress, add /wp-admin at the end of your website’s IP address in the address bar. Your new WordPress website is configured and ready to go! If you have any questions about this tutorial, or general questions about WordPress on Google Cloud Platform, please post them as comments below. I need to know that is there a way that I can change my wordpress admin user name on click to deploy? As of right now it shows my email ID, I want to change it to something else to log in. You can change your WordPress admin username, but you will have to configure SMTP beforehand in order to send emails from your VM instance. This is necessary because WordPress will send a confirmation email to whichever email you decide to use. http://www.marketrendfinder.com’s server IP address could not be found. I have also tried using the domain – http://www.marketrendfinder.com/wp-admin – but get the same message. I must be doing something wrong but cannot work out what. Do I need to activate something else? I know when working in wordpress offline I needed to activate the webserver to be able to edit the website. I used click-to-deploy and then changed the passwords and the settings in wordpress and the phpMyAdmin without using the ssh shell. I need to access WordPress to edit my website, obviously!!!! I revised the tutorial with updated instructions – please give it a look and let me know if you’re able to work out the issues. ‘We can’t display your DNS information because your named servers are not managed by us’ . Does this mean I have to change the name servers at go daddy. I have got an authorisation code from G-suite but have no idea where to use it. When I visit your domain in my browser I get the message, “The requested URL /wordpress/wp-login.php was not found on this server.” This indicates that the issue has to do with your server or WordPress file/directory structure. If you have a backup, I’d recommend restoring the website from the backup. If not, run sudo apachectl configtest and see if you get any error messages. If not, check your logs for errors. Fortunately I have not done anything with the website yet. Do you think it would be worth it to start again, ie delete the instance and start from the beginning. My problems only started when I tried to get the IP address to change to the website name, changing the named servers etc. Yes – I would recommend starting over again. Sometimes it takes a few times to get familiar with the networking/DNS component of Google Cloud, but once you do it a few times, it will become like clockwork. In cPanel, I can addon domain using addon domain menu. 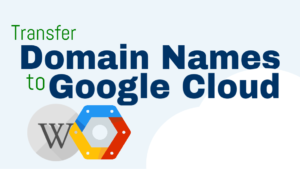 On Google Cloud, how to addon another domain, example: domain B? 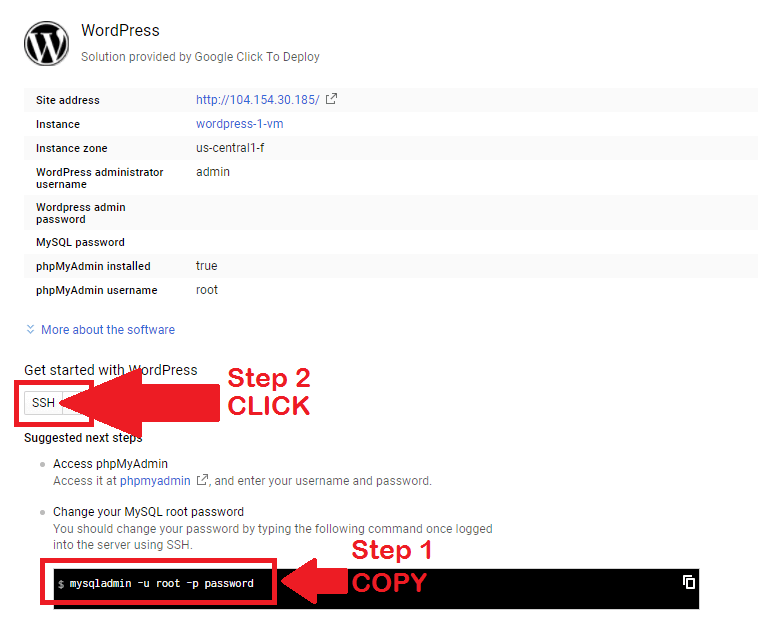 (in case, I already setup wordpress click to deploy with domain A). Your networking settings for adding/configuring domains are located under Network services > Cloud DNS. I don’t have the option for “micro” machine, only small. I’m currently within the free ($300/year) period, is this why? Another reason? I’ve tried several regions within the US and none of them offer it. Create your instance using the g1-small machine. After the instance has been created, stop the instance, then click the “Edit” button at the top of the page. At this point, you will be able to select the “f1-micro” machine from the machine type field. Make sure to save your instance after making the change; you may have to restart it as well. Thanks, this was the location. There is no such CLOUD LAUNCHER under billing in my console. Why don’t I have it? Hi Brady – they changed “Cloud Launcher” to “Marketplace”. Thanks. They are always moving stuff. Please update it in your video also. I kept searching for it for several hours. Fixed it! Thanks for the heads-up Amar. Do you ever run into permission issues within WP. I’ve installed WP on a number of google instances, but I usually seem to have issues with updating plugins and all. Also do you do any php.ini changes? If so, do you have recommendations? The updating of plugins/themes always seems to be a permission issue. Is wordpress added to www-data by default or does that have to be setup in ssh? Yes – I run into permissions errors occasionally. Plugins won’t be able to write to wp-config.php with the default permission level, as is necessary with some of the cache plugins. This is the permissions-related issue that I most frequently get questions about. I occasionally change settings in php.ini, for instance upload_max_filesize. There are other settings that I’ve changed in the past, but I can’t remember what they were. Your MySQL root password will be shown on your deployment settings page. You can access this page by going to Deployment Manager > My solutions, and then clicking on the WordPress instance that you just deployed. I also can’t log into phpmyadmin. None of the options I’ve had have taken me to a console. I can get into WordPress ok but neither of the temp passwords shown work with phpmyadmin. None of the options I’ve had have taken me to a console. I tried going into the console but I couldn’t find mysql there either or get in with mysqladmin. Did you try both ‘user’ and ‘root’ for the phpMyAdmin username? I replied to this earlier as couldn’t get into the correct place in console. I copied the command correctly this time and it all worked. Great – I’m glad to hear you were able to get it working! I’m not sure I fully understand your question. Check out this response to Ridz that I just drafted a few minutes ago. It talks about how to view your MySQL password, and the command that you can run in your SSH terminal if you need to reset it. If this doesn’t answer your question, please provide additional details and I will get back to you shortly! After I enter the command mysqladmin -u root -p password , and try to enter the password the I cant. Can not paste or type it into the ssh. What error message do you see when you run the command? Can you paste the output that you’re seeing in your SSH terminal? I have the EXACT same problem.. I cannot type anything when it asks for a password. The password will not show up in the terminal, even though it is registering everything that you type. Just type your password, then press enter. Again, you will not see the password, but it is being registered. Check out this resource for more information. Hello, the state very attentive to your videos and tutorials. He has confronted me with a great challenge and he has come forward. I would like to know a detail, I want a good, safe and reliable service. I have seen many hosting, my idea is to help several people with their web pages in wordpress. And I really liked google cloud, my clients do not have many visits, as well as they do not have presence on the internet. You that I can recommend, I already registered in your group of people, I am in pending status waiting for your check. I am using the 300 dollars free of Google Cloud but I do not understand very well how I can lower the prices. Sometimes it says 0.01 dollar but I see that you have displeased me more than 60 dollars, the problem is that I have 1 page created and another that I have only one page, I am creating it. You think, I continue with the google service or I like to use other options where the monthly payment is 5 euros per month, thank you very much. Use the $300 dollars to play around with Google Cloud and get comfortable with it. Only when you have a good understanding of Google Cloud should you consider hosting your websites on the platform. And $5 dollars per month isn’t a lot for managed hosting, and it wouldn’t be worth the hassle to move your client’s websites to Google Cloud unless you know how to design a reliable system and are comfortable troubleshooting it when it breaks. 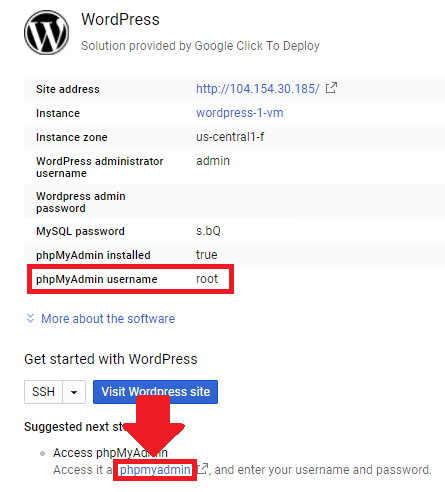 After configuring a domain name with your Google Cloud WordPress installation, as shown in this tutorial, you should be able to access your WordPress website from youdomain.com/wp-admin. I need your help as soon as possible please. I am unable to proceed with step 3. When I click on SSH, after some time of loading I get this error saying “An error occurred while communicating with the SSH server. Check the server and the network configuration.”. I’m trying it from past 3 days. Same result. I even tried with sdk but getting some different error. That’s not something I am able to help you with – that sounds like an issue with your account itself. Either open a new account or contact Google Cloud support to get the issue resolved. Please provide more details regarding the error that you encountered and I will see how I can help. Please provide more specific details, such as your domain and specific error messages that you’re seeing (if any), and I will see how I can help. lexzl.com did not send any data. This tutorial does not cover domain configuration, so your domain will not work with your site until after you complete this tutorial. At this point, after completing the setup and install tutorial, your website will only be accessible using your virtual machine’s external IP address. how i change wordpres website name? i mean like this ” google.com”? Use this tutorial for instructions on how to point your domain name to your website on Google Cloud. I wish my install went smoothly! I followed your steps exactly, but when I pressed enter on the ssh terminal it told me I had a bunch of errors about 3 ssh things. Please help, Joe! What exactly were the SSH errors? Can you copy and paste them here? First of all, thank you for this great tutorial. I followed your video but I encountered a SSH warning similar to what Marie encountered. Below are the details of the warnings. before being able to generate SSH keys. I tried to continue and now it’s asking me for a passphrase which I’m not sure what the value is. This is normal behavior. The system will generate an SSH key pair the first time you connect to Google Cloud. Just enter “Y” and then press “enter”. Don’t enter a passphrase, just press enter again to continue without creating a password. Yes I was able to proceed using the procedure you mentioned but I bump into some issue which I will raise in another post. Thanks again for your detailed tutorials and being responsive to all our questions. Great tutorial! 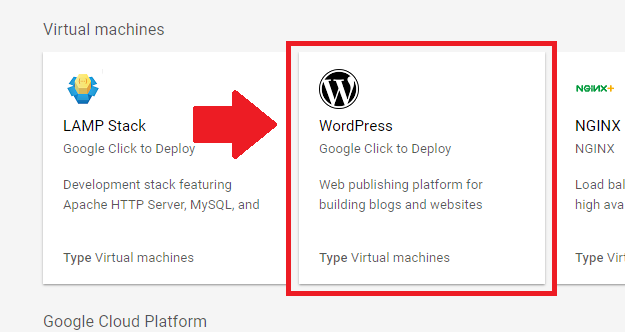 I have setup WordPress on Google Cloud using Click To Deploy method. I installed Braintree by PayPal and briefly experimented with the Sandbox environment but I’m ready to switch to the Braintree production environment, go live and start taking payments on my site. In your server code, update your configuration to production values. I’m assuming to use the PHP method since using Google Cloud but not sure where to type this command. Any ideas? Where wordpress files located in google compute (wordpress Google deploy) ? The WordPress files can be found in the home directory at /var/www/html/. How do I set up a second (or 3rd) website? How do I deploy other sites on the same VM or they separate instances? I can’t seem to find this anywhere. I do websites for small orgs. part time. BTW, your tutorials are very helpful for getting started. Thank you. You can use WordPress Multisite to host multiple WordPress websites on a single VM instance. That being said, I’d only recommend using WordPress Multisite for small, static websites that don’t get a lot of traffic, primarily as a means of cutting costs. Run your high-value, high-traffic websites in their own instances. 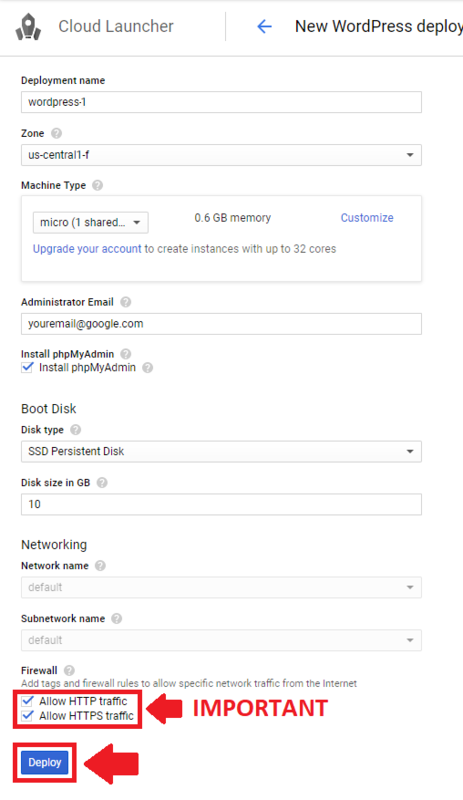 You can run an unlimited number of instances in your Google Cloud Platform account.